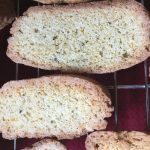 I wrote about on “the battle rages on” which is actually yet its own adapted recipe Valerie Bertinelli’s Helen’s Black Pepper Biscotti. Sift together the flour, baking soda and baking powder in a medium bowl. Stir in the pepper and salt. Set aside. In the bowl of a stand mixer fitted with the paddle attachment, beat the butter on high speed until pale and light, have the patience to let it do it’s work – it could take several minutes. Add the sugar and beat until light and fluffy, about 7 minutes. Reduce the speed to low and add the eggs one at a time, beating well after each addition. Add the orange and lemon zest, vanilla and almond extract . If using nuts, add them now (You can also do this by hand and fold them in then work the dough by hand till smooth). 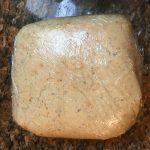 Pour the dough out on to a lightly floured plastic wrap covered surface or clean counter top. Gently knead the dough to shape with your hands to form a thick round ball shape. The dough is super easy to handle at this piont. Cover the dough with plastic wrap and refrigerate for 30 minutes. (For this batch I omitted nuts). Line two metal ice cube trays with parchment paper and clip in place (or go old school and line 2 baking sheets with parchment paper (nonstick silicone liners also work). 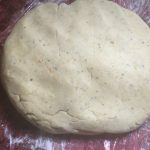 Remove the dough from the refrigerator, unwrap and divide the dough in half, and shape each piece into a 12-inch log, about 2 inches across and 1 inch tall. 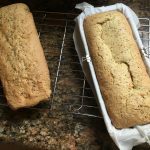 (Note you can make these as wide or thick as you like – I find because of the texture and taste of these, I tend to like a finished bake that is about 3 inch long and 1.5 inch high you may have to play with it a few times). But they don’t need to be prefect. In fact any uniform shape will work. 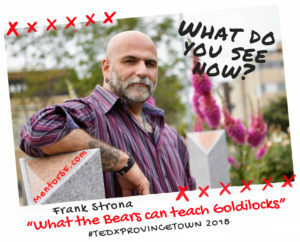 Bake until the logs are cooked through and lightly browned on the bottom, about between 30 – 35 minutes, depending on your oven and pans. The humidity will also play a role check as you bake. Watch them the last 5- 10 minutes as this could differ based on your pan and stove temp. 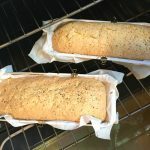 Let the logs cool for about 5-7 minutes on the baking sheets (leave the oven on), then transfer them carefully to racks (remove the parchment paper) to cool 10-15 minutes more. Using a serrated knife, slice each log either on the diagonal (to give you a fancy shape) or straight across into 3/4-inch-thick slices. Arrange the slices cut-side down on the baking sheets and return to the oven until well toasted, 10 to 15 minutes more, I general flip mine over about half way to get even color. 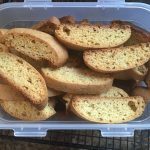 Note: These biscotti have a great golden color to them which will darker to as you “second bake”. 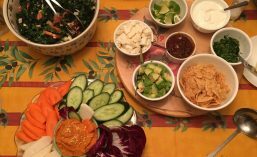 If you want to keep them less brown; adjust time or instead of laying them on the cut sides, leave the standing cooked side down. 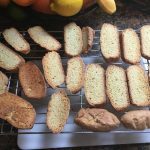 Transfer the biscotti to cooling racks to cool completely. The longer they bake the harder they become. Note: they will continue to harden as they cool. Store in tins or air tight containers. 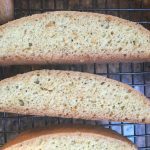 This entry was posted in Recipe Book and tagged Biscotti, Recipe. Bookmark the permalink.